There will be revised opening hours for the Clubhouse and Lir Bar & Restaurant from October 8th. The premises will be closed on Monday and Tuesdays and will be open as normal from Wednesday through to Sunday. After the Bank Holiday Monday it will be closed Monday to Wednesday and open as normal from Thursday through to Sunday. 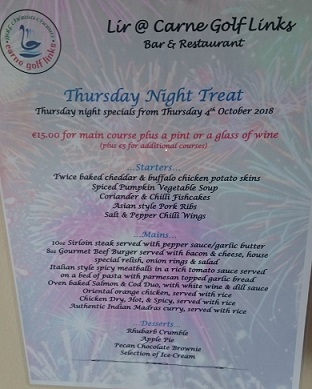 Why not check out the Thursday night treat night menu and see what everyone is talking about.